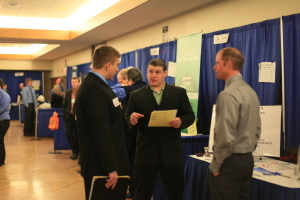 Over 200 employers will converge on University of Wisconsin–Stout’s Sports and Fitness Center between Oct. 14 and 15. From 10 a.m. to 3 p.m., students are invited to network, interview and take a look at many prospective employers. “The Career Conference is a two-day career event where students have the opportunity to meet with employers that are interested in hiring students for full time jobs or co-cop positions,” said Bryan Barts, career services director. This is the Career Services Office’s 36th year of putting on this event, which wouldn’t be possible without the 160 student volunteers. A board of proactive students, the Executive Career Conference Committee, is in charge of piecing the event together. “Students who are showing initiative and serving in volunteer roles play a pivotal role in the success of the event. It’s a critical piece,” said Barts. Invitations are sent out to companies throughout the summer. Many of these companies come back every year, while some are new to the event. “A lot of them have a history of coming here because of the quality of the candidates,” said Barts. Each day offers a different selection of employers with varying degree wants, but students are encouraged to venture outside the boundaries of their major. The conference is always a large event, but this year students will be able to navigate through the conference and budget their time wisely with the help of the new Stout Career Fair app. The app has a list of companies in attendance, a fair map, announcements and tips on how to get the most out of the career fair. There will be about 170 companies doing same/next day interviews at the conference, so students should be prepared. Students wanting to brush up on their interviewing skills can visit CareerLinks and check out Interview Stream, which allows them to practice interviewing skills through a webcam in their own home. However, the conference isn’t just for students looking for employment. In addition to online resources, Career Services offers Career Conference Crash Courses that occur during Oct. 7 through 9. Check out the Career Services website for specific times and locations. If you’re thinking you’d rather wait until spring to actually look for a summer internship or co-op, don’t worry. Last year was the premiere of the Spring Career Conference, which Barts says will happen again this spring.